Time flies so fast! It’s 2019! New Year is always a perfect time for a fresh start, new life, new beginning and a new you, which is why we have New Year’s Resolutions. Making resolutions at the start of the year is easy but sticking to them for the rest of the year may be difficult. More often, we find ourselves deserting our resolve and slipping back to our old ways within a month or two. So what do we do to keep our resolutions this year? Our chances of success are high when we set a clear goal and action plan in mind. Making our health a priority is the most important and rewarding resolution we can make. This does not mean that we need to lose 30 pounds in one year, but we want to be healthy enough to focus on other things besides illnesses. Good health leads to a better quality of life. GOAL #2: LIMIT refined sugars and GO for fiber-rich diet – Excessive sugar intake can cause obesity and diabetes which may be detrimental to our health. For adults, it is recommended to limit the sugar intake to 5 to 8 teaspoons per day. Instead of spoiling yourself with the sweets, why not go for the greens! You can never go wrong with the veggies and fruits because of its health benefits. GOAL #3: Get enough rest and sleep – We got obsessed so much with our phones that we spend long hours every night scrolling through our social media accounts which affects our sleeping time. This year, you should aim to get at least eight hours of sleep at night. Better quality sleep can improve your energy levels, mental sharpness, and boost your mood. GOAL #4: Build exercise into your daily routine and maintain healthy weight – Keep healthy by being active. Exercise for at least 30 minutes per day. Many find it hard to make time for it but you can still do it if you incorporate “minor” physical activities to your daily routine, such as walking. Regular exercise can help in maintaining healthy weight as well as optimizing your heart health. To achieve your weight goals, it is more effective if you combine exercise with a healthy diet. Developing healthy diet starts with choosing delicious healthy foods. In helping you lose weight, you may choose to try Gardenia Slim N’ Fit Wheaten Bread, the only bread in the market that contains L-carnitine, a nutrient that helps in burning fat during workout. Two slices of it will only give you 145 kcal. That is even lesser calories than a cup of rice! 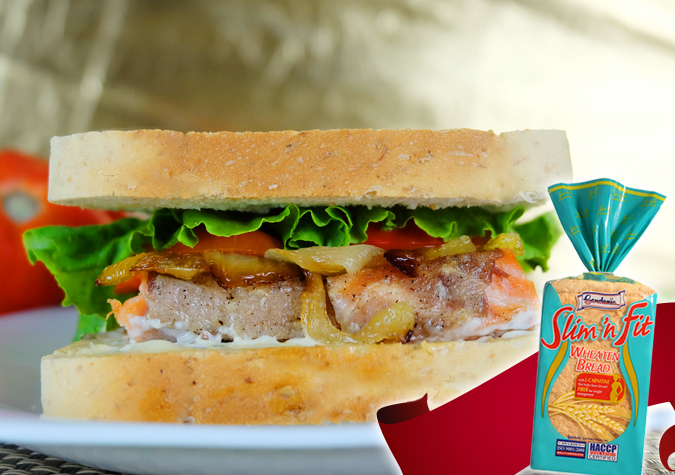 You can try this healthy Gardenia Salmon Club Sandwiches to spice up your Gardenia healthylicious snacking time. Mix mayonnaise, 2 tablespoons basil and lemon peel in small bowl. Mix the remaining basil, olive oil and lemon juice in large glass baking dish. Add the oil mixture on the salmon; turn to coat. Cover; chill for hour. Sauté until onion is tender and beginning to brown. Prepare the grill (medium-high heat). Grill fish until it gets opaque in center (about 3 minutes per side). Grill bread until golden (about 2 minutes per side). Spread the mayonnaise mixture over 1 side of bread slice and top each of the slices with bacon strips, tomato slices, onion, salmon fillet and lettuce leaves. Sandwich it using the remaining bread slices. Let’s make 2019 the year we finally achieve our health goals. Have a great year! For more recipes, news, tips and promotions, you may visit our official Facebook, Twitter, Instagram and Youtube channel. A good bread treat starts with a good bread. Whip up exciting bread treats for the family. All you need is a dash of creativity, a sprinkle of love, and an easy-to-follow recipe from Gardenia.